What shines in gold, pink, white or black and looks ready to make a splash at Mobile World Congress next week? A pretty little Android smartphone that goes by the code name "Sophia," that's what. The persistent rumors of Huawei's latest Ascend P7 smartphone appear to have finally hit pay dirt, thanks to a leaked image that just popped up on Chinese social network Weibo. Nowhereelse.fr turned up the image of the Ascend P6's successor that will presumably be offered in black, white, gold and pink - which makes perfect sense for a smartphone whose code name is supposedly Sophia. 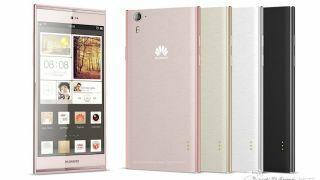 Huawei is expected to formally announce the Ascend P7 at MWC 2014, although little else is known about the Chinese manufacturer's latest smartphone. The rumor mill has been checking off all the requisite list of features in recent weeks, with the Ascend P7 expected to storm onto the scene with a display somewhere between 5- and 5.5-inches at 1080p HD resolution. Power users are also anticipating a 1.6GHz quad-core processor with Android 4.4 KitKat in tow as well as 2GB RAM and 16GB onboard storage. Last but not least, Huawei will reportedly infuse the handset with camera superpowers, including a 13-megapixel rear and 8-megapixel front-facing optics. Over the weekend, Huawei threw down the gauntlet against rivals Apple and Samsung with a cheeky YouTube video touting an "amazing" front camera for its upcoming smartphone, while throwing in a peek at a new tablet for good measure. We'll see what Huawei has in store in the coming days. Turn to TechRadar for all the latest on the upcoming Samsung Galaxy S5!